and his historic achievement of being elected the first African-American President of the United States. No matter what your politics or whether you agree with his policies or not, you must admit that history has been made tonight and it’s a good history. It’s good for our country, it’s good for our people, and it’s good for the world to see that freedom and democracy work. America’s election of the junior senator from Illinois is not only historic in the obvious sense, it is historic in a deep and healing way. This nation has been plagued by racism since it’s inception. We have endured civil wars, riots, inequity, the civil right movement, and countless other challenges, none more felt than by the African-American community. This long lasting and deep seated racism is not only felt in the black communities and urban neighborhoods, it effects all Americans, from the immigrant workers to the most affluent CEOs. It affects how we act with one another, how we speak to each other, and many times it affects us so deeply that these feelings cannot even be uttered in public. 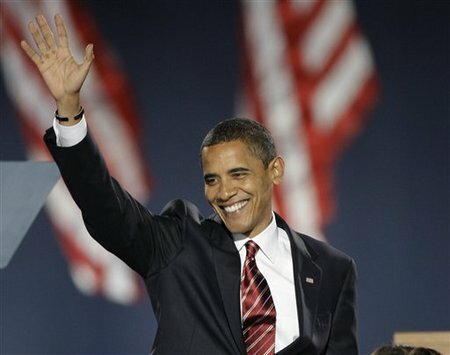 Barack Obama’s decisive election win is one step further away from America’s tarnished past, and toward a more united future. It is my sincerest hope that today’s election has proved to any doubters, white or black, conservative or liberal, that in this land of the free, anyone can accomplish anything no matter what the obsticals, sterotypes or preconceptions. This is the United States of America and we are stronger when we stand as one nation, under God. We may not agree on many things, but we are all united in the fact that we are Americans and we can stand proud in front of the entire world as a shining example of democracy at it’s best. In the months and years ahead, I will be sure to voice my opinions when I disagree with Obama and the liberals in Congress as I have always done. It is my hope that he will serve like many past presidents and govern more to the center and do the peoples work, not his parties. I trust that he will live up to his campaign promise to reach across the aisle to bring Americans closer together and work to end the divisiveness in the country. I will give him the benefit of the doubt to fix our economy, but will be watching very closely for any dangerous or civil rights infringing policy making. I will also prepare to elect a Republican president in four years. However, I am a patriotic American and I will stand with my President against this nation’s enemies at home and abroad. I am proud of our democracy even when “my side” doesn’t win. I am proud that Americans can, and have, looked past skin color (and names) and were able to choose Obama to lead this nation. It may seem strange but despite my guy losing and am proud to have voted today in this historic election. Most of all tonight I am proud to be an American! Last night I watched one of the most compelling speeches I think I have seen in a very long time. I was thrilled to see Sarah Palin stand up to the liberal media, Barak Obama, and Joe Biden all in one fell swoop. More remarkably, she may have been ad-libbing much of the speech due to a problematic teleprompter. Some sources claim there was no problem, while others are claiming the operator may have been inexperienced with a new machine. In any case, her delivery was exceptional and undeniably historic, as the first woman to be the Vice Presidential nominee for the Republican party. She was poised and spoke as a true American, one who will be able truly lead reform in Washington. Any doubt that I had regarding her ability to rally people behind her, and lead a cause was erased with last night’s powerful speech. From her remarks on special needs children, to her understanding of the global dangers facing us today, Sarah Palin will undoubtedly serve America first. I especially enjoyed the jabs at the inexperienced Presidential nominee and his bloviating side kick. John McCain did well to pick her as his Veep, no matter how “last minute”. Captain Leadbottom can look forward to supporting a Republican ticket once more. Yet another slanderous story regarding VP hopeful Sarah Palin and her family will be reported by the supermarket tabloid, The National Enquirer, tomorrow. I wrote yesterday about the tabloids US Weekly and OK Magazine, and how these magazines need to stay away from the politics that shape our nation. Now, The Enquirer is about to publish an outright vicious story accusing the conservative Alaskan governor of infidelity and of pressuring her 17 yr old daughter Bristol to marry the father of her yet unborn child. This story is not going to make or break the next big blockbuster movie that a star may be promoting. It is far more serious. This kind of unsubstantiated trash can only serve disrupt or even potentially destroy a major political figure on the precipice of history making nomination. It dangerously disrupts our election process with the only motive being the all mighty dollar. This is not news people! This is tabloid trash that is trying to pass itself off as journalism by buying lies. Reporters don’t pay for their stories like the Enquirer does. A real journalist sources and back ups their claims with fact and documents, not quotes from second hand “friends of a friends” here-say. I do reject it, and will not fall for this sensationalist fodder and I hope you don’t either. I hope to see the National Enquirer pay dearly in court if this story is proved to be without merit. Vote McCain/Palin in November friends! We need to kind of fresh, conservative leadership the Gov. 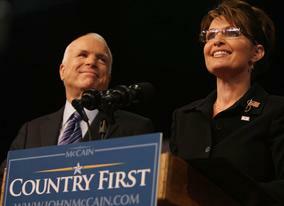 Palin brings to the table and the kind of dedication to country that a McCain / Palin ticket promises.